On this day in 2012, just two days after the new law came in, three people were arrested in a place where they were not living. Three men have been arrested under the new squatting legislation. 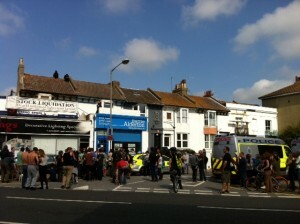 Police were called to a residential property in London Road, Brighton today, (3 September) and after several hours two 22-year-olds and a 29-year-old were taken into custody. Two other men, who were on the roof of the building, safely made their way down from the property and were not arrested. The property is now being boarded up by the landlord’s agent. Actually the two other people escaped! To fight another day…. Maybe to make this website… Or maybe not. It is interesting that the police assumed they were male, in any case. (b)a building is “residential” if it is designed or adapted, before the time of entry, for use as a place to live. (4)For the purposes of this section the fact that a person derives title from a trespasser, or has the permission of a trespasser, does not prevent the person from being a trespasser. (6)In relation to an offence committed before the commencement of section 281(5) of the Criminal Justice Act 2003, the reference in subsection (5) to 51 weeks is to be read as a reference to 6 months. (7)For the purposes of subsection (1)(a) it is irrelevant whether the person entered the building as a trespasser before or after the commencement of this section. (b)in subsection (3), for “or (iv)” substitute “, (iv) or (vi)”. (9)In Schedule 10 to the Criminal Justice and Public Order Act 1994 (consequential amendments), omit paragraph 53(b).